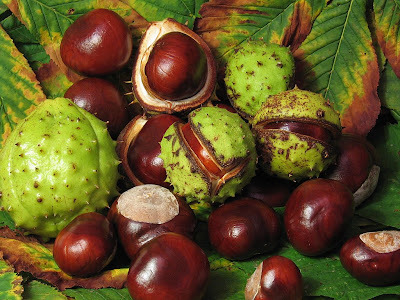 When I was knee-high to an accident prone grasshopper, one of my favourite Autumn pass-times was collecting conkers. Now, I have no idea if my American readers have any idea what a conker is, so here's a handy-dandy Wikipedia entry. Short version - they are the nut from the Horse Chestnut tree. Now, I say I collected conkers, but the game you played with them is actually called conkers, however, for all intents and purposes, same difference. Around late August - during the last days of the summer holidays - packs of us kids would roam around the hedgerows, copses, forests and woods, looking for The Trees, the afore-mentioned Horse Chestnut. We would scout out the ones hidden in the middle of other clumps of trees, or "inaccessible" to normal kids thanks to brambles, nettles or whatever else, and then we would wait, checking on the tree every day or three to see how it was getting on. Then came the hunt for the perfect Stick. The stick that would be lobbed into the branches to dislodge the nuts, letting them fall - in their spiked armour - straight down to us. Injuries were not uncommon - usually a spike to the noggin, a slip from a branch or, worst case scenario, The Stick coming straight back down onto you or a friend. We would then scurry around, stashing the conkers in pockets, socks, sleeves, bags - whatever we could do to carry them off. Within a few days, the trees were naked and robbed of their fruits, and we would be sitting around with piles of them, putting them in shoe boxes or back packs, sharing them out and detailing the best way to make them hard. Sometimes, they would get baked. Sometimes they would be stored in vinegar for a couple of days. Or buried in sand. Or rinsed in boiling water. Or any and all of the above. Sometimes, for fun, we'd play with naked ones - untreated, nothing but their own skin to harden them up. I found ones dried in the sun over a few days to be rather solid and won more often than not. Then came the great drilling. Now, obviously, none of us were allowed to play with power tools - after all, if The Stick could cause a concussion, what would a Black & Decker Hammer Drill do to us. So, it came down to corkscrews, or big fat household screws, or a snaffled butter knife - anything that could bore a hole through them. After that, the kids of the area suddenly found their shoes falling off, as everyone then hunted for string or similar to hang them from. Invariably, nabbing the garden string from the shed was frowned upon, so it fell to "lost" shoe laces. They snapped, mum, can I have some more and similar stories. And then we were ready. Armed with our shiny brown gems hanging from a string, ready to do battle with one another. The object was simple. Conkers, a two-player game, involves the first person dangling their conker in front of them, while the second takes a swing with their conker. The aim was simple - smash the opponents conker. There were various side-rules that I can remember - if you miss, the opponent got two shots. If you managed to hit with enough force to spin their conker 360 degrees, you got an extra hit (Windmills!). If you dropped your conker - swinging it or as a target, the other player could try a Stompsis/Stampsis to smash it. And on and on, until you broke your conker, or yours was broken. If your conker wins, it becomes "a one'er" in that it has broken one. The a two'er, a three'er, four'er... and so on. We would play daily for weeks, at home, at the park, at friends, at school... Some people had legendary conkers with double-digit wins, and their secret was always jealously guarded. The devestation in the area was always obvious, with smashed conkers littering the streets where we played. Then, they would be stored safely in their shoe boxes, hidey-holes or bags, and stashed in the bedroom - right until the smell of rotting nuts alerted the parents, and their removal was ordered. Over the years, I've watched other kids doing the same thing, going through the rite of passage of conkers, but gradually, it's slowed and died down. Rules, stories and other rubbish crept into the news about it being dangerous, teachers banning it and - in typical Health and Safety Goes Nuts attitude - the press ran with it. Seeing stories about teachers banning it and schools giving kids goggles (I kid ye not) to play it pissed me off. Sure, you could get hit by a shard of exploding conker, maybe in the eye - but I don't know anyone that got blinded by playing the game. The worst injury was usually when you got a twatting across the knuckles with it. It hurt, but again, it was "ouch my knuckles - my swing" and not "oooooh I'm suing you!" This year, I've seen several promising conker trees, watching the nuts develop and fall. And they've fallen naturally. No kids scurrying around collecting them. No little urchins sitting under the boughs of the tree sharing out their horde. No kids with their shoelaces missing... The shiny brown conkers are just sitting there, waiting for the elements to do what they do best. It won't be long till they vanish under the falling leaves, maybe to grow into new trees that won't be pilfered by kids, their parents not caring that Junior is sitting indoors, playing on the computer, talking to friends on messenger, running around a fake world on the console. hehe we stil play conkers ;o) some things you never grow out of. But as for health and safety gone mad, yep I agree with you there. Yerp! Banning conkers - think of the stupidist thing you can, then see if anyone takes it up as a serious health and safety issue. Oh btw, see you've got a new, clean-lined header up - very nice. i'm not even 30 yet, and i'm about to sound like an old codger, but kids these days are too damn soft, in my opinion. natural selection is there for a reason. if a kid is stupid or clumsy enough to crack his head open falling out of a tree, lose an eye to a conker, or poke rabid badgers with a stick, then they deserve what they get. when i was a kid, we had playgrounds with cement and gravel. not this stupid foam-rubber and woodchips rubbish. i even had video games, but i was given very strict time limits on them, and primarily, i played outside. so i stand by it. kids these days are pansies, and their parents are too damn lazy to bother with actual parenting.